I wanted to dry some sage without using my dehydrator…I checked first with the National Center for Home Food Preservation and decided to use their directions for drying just leaves separately from the stems. 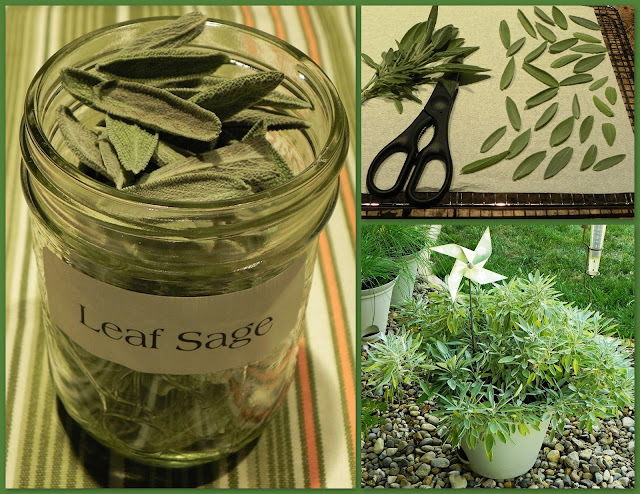 "Another method, especially nice for mint, sage or bay leaf, is to dry the leaves separately. In areas of high humidity, it will work better than air drying whole stems. Remove the best leaves from the stems. Lay the leaves on a paper towel, without allowing leaves to touch. Cover with another towel and layer of leaves. Five layers may be dried at one time using this method. Dry in a very cool oven. The oven light of an electric range or the pilot light of a gas range furnishes enough heat for overnight drying. Leaves dry flat and retain a good color. When the leaves are crispy dry and crumple easily between the fingers, they are ready to be packaged and stored. Dried leaves may be left whole and crumpled as used, or coarsely crumpled before storage. Husks can be removed from seeds by rubbing the seeds between the hands and blowing away the chaff. Place herbs in airtight containers and store in a cool, dry, dark area to protect color and fragrance." Dried herbs are usually 3 to 4 times stronger than the fresh herbs. To substitute dried herbs in a recipe that calls for fresh herbs, use 1/4 to 1/3 of the amount listed in the recipe. I have to tell you that this method works, and the oven light made the oven noticeably warm, but not enough to dry them overnight! My leaves were completely dry and clean, and the humidity was low. I placed them on open cake racks so I could move the paper towels without disturbing the leaves. But it took 2 days to dry them, and the second day I separated them into 1 layer each. They still weren't quite dry enough – and I heated my oven, turned it off, and then put them back in overnight to get them dry enough to store without molding. The next batch, I preheated my oven 5 minutes, then turned it off, left on the light, and put my sage in single layers on two shelves to dry. This worked much better, and they dried in 24 hours. Thank you for this very useful post, and I'm going to look the Center up, too! I put mine in paper bag in my car for about 4 days and they dry great and potency is excellent! Great idea...our weather here in Iowa has certainly been hot enough for that the last two weeks! I was just looking at my herb garden trying to decide the best way to put up my herbs. Great post. Followed you from the Homestead Barn Hop.